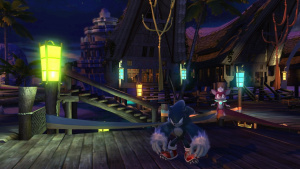 Jungle Joyride and its hub town Adabat form the eighth area visited in Sonic Unleashed and draws inspiration from Southeast Asia. Sonic can run through a small village, a jungle, and along a beach. A notable feature is the proliferation of "stilt houses." These buildings can be seen in South East Asian countries such as Thailand, Vietnam, the Philippines and consist of wooden dwellings erected on stilts over water. This makes the Quick Step a useful tool in navigating through this level. The ruins seen around the level in both times of day are reminiscent of the Buddhist relics seen around Asia, primarily from Angkor Wat in Cambodia. Adabat is the location of the penultimate Temple of Gaia which Sonic and Chip have to visit. The area opens up after the completion of Empire City Night Act 1. After collecting the Day and Night Gaia Keys from their respective Acts, Sonic heads towards the Temple... only to encounter Dr. Eggman in his Egg Lancer! A great deal of Wall Running later, Sonic powers past and re-powers the sixth, purple Chaos Emerald. However, in this Temple there's a strange mural which responds to Chip, giving him back his memories as the million-year-old Light Gaia. In the subesquent cutscene, Chip tries to fly off to stop Dark Gaia by himself, but Sonic convinces him to accept his help. Teanchai (ティアンチャイ) - A gifted fisherman who once landed a seven-foot whopper all by himself. Teanchai is a very friendly person, just so long as you don't bring up his daughter. Jamal (ジャマル) - A young man who hopes to one day be an even greater fisherman than his father. His passion often gets the best of him: one day he even set sail in a tempest, exclaiming, "Where there's a will, there's a way!" Well, apparently, that way was straight down, because the boat sank in the storm. Thankfully, its intrepid passenger survived. Lately, Jamal has spent more time calming his father's turbulent mood than the sea's turbulent waters. Kaeo (ケーオ) - A nimble-fingered young man with a penchant for mascot-making. Eventually this hobby developed in a full-time job, and he opened up a shop. Kaeo's next project: making a mascot version of the spiky blue hedgehog who recently turned up at the village. Rudi (ルディ) - A hardworking, caring young lady who looks out for her father, her siblings, her grades... Yes, she's a fine girl. Don't bother asking what's in that basket she's balancing on her head, though. That's her own little secret, see? Nagi (ナギ) - A well-meaning girl with the unfortunate habit of causing disaster at nearly every turn. Nagi dreams of growing up to be a wonderful young lady, just like her sister Rudi. Hot Dog Vendor (ホットドッグ屋) - The manager of the "Don Fachio" hot dog mega-franchise's Adabat location. He's more cool and aloof before breakfast than most men are all day long. His handmade dogs use links made from fish for a fresh, light taste. The main Day Act, accessing this stage requires (in the Xbox360 and PS3 versions) Chip's Sun Power to have reached level 7 at 120 medals. Accordingly, there is often a lengthy medal hunt required of players before they can even get into this stage. The level starts with a Quick Step heavy section amongst the stilt houses, before moving into the jungle and hopping between islands. 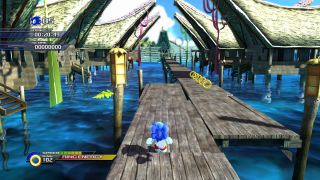 Careful use of Sonic Boost and Speed Drift is required to keep Sonic going above the shallow waters. A 2D level taking place in one of the ruined temples, this level has 3 laps of the same course. It demands careful use of Wall Jumping. This Act takes the Quick Step sections from Act 1 and expands them to make an entire level. You'll have to be very quick on the / triggers here. Look out for the Egg Shackles near the end that rob you of the ability to use Quick Step! The main night act involves a lot of Werehog platforming across moving stone slabs, with frequent opportunities for death by drowning. These are some long combat sections, and puzzles where you have to press plant-themed buttons in an order that mirrors a blooming flower. A lot of fighting in this level, as well as pole-swinging through intermittant waterfalls. In the sub-mission, Jungle Fright, it's possible to access an unused puzzle behind where the goal ring would be in the Night time level through glitching. The room itself is filled with water (which isn't visible unless a patch released on March 12th is applied to the game), so falling signifies an instant-death and also contains an otherwise unused palm tree object which Sonic can knock down for later use in the room. The gimmick of the room is not unlike the snake room in Sonic Adventure's Lost World, where you must raise the water level to advance in between platforming. At the top awaits a door which the Werehog can open, leading into a stairwell surrounded by several statues, plants and torches, as well as the apparent original goal ring of the level. Touching it in this mission leads to an automatic Mission Failed. This area can be accessed in the main level too, but it lacks any object placement to continue the puzzle. It was believed to have been sealed off due to difficulty with object placement and getting the water to appear and rise properly as the player progressed through the room. This area appears as Night Act 3 with a slightly different layout. The sixth and final Sonic Unleashed downloadable content is the Empire City and Adabat Adventure Pack, serving as the second content pack to update two continents with new stages. Jungle Joyride gains two new daytime stages, one new nighttime stage, and harder or extended versions of one daytime stage and one night time stage. It was released on Xbox Live for 250 MS Points and on the PlayStation Network for $3.00 on 11 June, 2009. Day Act 1-2 is a harder version of Act 1. While the layout has changed minimally, the waterfall section at the end of the stage received the most overhaul, with Sonic running on the waterfall itself then playing the area backwards. Day Act 4 is a speedy water running level with very minimal platforming. 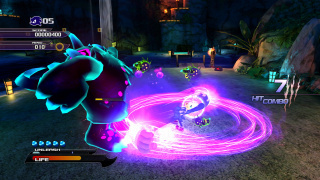 The stage can be beaten in less than a minute by normal play. Day Act 5 is another water running level, only with more hazards than the last and a bomber robot segment over the water. It features a full pipe partway through the level, which Sonic can use to run on the roof of to avoid mines and spikes. Night Act 1-2 is a harder version of Night Act 1. The player begins the level infront of the waterfall cliffs and plays the level backwards, fighting a total of four titans along the way. There's a little platforming and avoiding spiked grabbable posts as well. The former beta area now as its own level. Players must control the water level in the room to reach the door at the top. This leads to a monster encounter before the goal ring appears. These mission can be accessed by speaking with the hot dog vendor in Adabat after completing the corresponding Day or Night Act. Completing a level 1 mission unlocks the level 2 mission and earns 1 Seafood Dog, completing a level 2 mission unlocks the level 3 mission and earns 2 Seafood Dogs, completing a level 3 mission earns 3 Seafood Dogs and completing all of them will unlock the Fried Clam Roll Achievement.